ORIGINALLY POSTED ON The Genealogy of Style. One may well ask, as Henri Matisse was best known for his models being clad in Moroccan or Parisian attire, rather then in Romanian ethnic dress or better still, not clad at all… So, why a Romanian Blouse, out of the blue? Source: A Glimmer of Optimism | The Genealogy of Style. More delights from Pippa Rathborne to make up for an inability to create my own posts with the current connection within any decent time frame; I think the Dark Angels post took me three days! Plus ca change! The book is not a mere prop. This was a princess who loved reading and collecting books for their own sake. She ended up with 5000 volumes in her library. Marie-Adelaide was the favourite daughter of Louis XV. She never married and spent fifty-seven years of her life at Versailles. Unfortunately for her she was intelligent, and ambitious, so being denied a fulfilling role at court embittered her. She survived the Revolution, and all her brothers and sisters, and her nephew Louis XVI and his queen, and died in exile in Trieste in 1800, aged 67. Today is the 110th birthday of Cecil Beaton. He could evoke every emotion with his camera. His photographs are as breathtaking as they were the day they were taken and you feel like you are part of them, you can feel the love, the sorrow, the loss, the opulence. The world is a better place because of Cecil Beaton. And here’s the second in the series using black & white clip art from The Graphics Fairy. 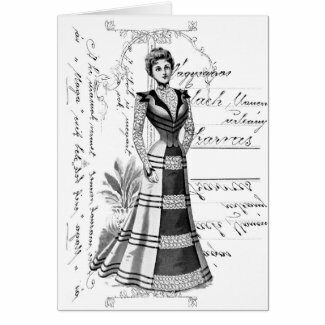 In fact, Karen only added this fashion plate lady to her blog today! Pink Bustier Mother’s Day — New! The bustier or corset was once a vital part of a lady’s wardrobe, not, as today, a fashion statement that anyone can choose to embrace, whether Madonna, Rihanna or Eddie Izzard. Worn as an under- or outer-garment, its purpose has always been to enhance female sexuality by narrowing the waist and pushing up the bosom to effect an enticing décolletage. But imagine the pain of a whale-boned corset, for such they were until relatively recently when mesh panels became an option. Prior to that, iron had been used; even when whalebone replaced iron, wood was sometimes used. Imagine, also, the laces at the back being tightened beyond the reach of breath! Do you remember wincing at the scene in Gone with the Wind where Scarlett O’Hara (Vivien Leigh) is having the laces of her corset pulled to a circumference of 18 1/2 inches — thought to be the ideal for female beauty — by Mammy (Hattie McDaniel)? 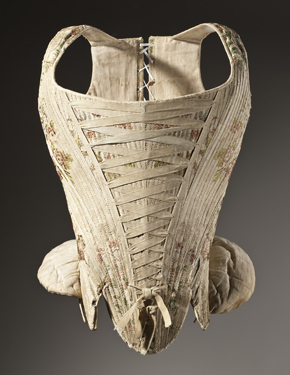 Although corsets have been around, possibly since 2000 BC, their popularity was especially marked in European society during the 16th century and later in the Victorian era. The bustier graphic from Digital Kiss probably dates from a Victorian fashion plate illustration.